Ionospheric channels exhibit random space, time and frequency variations which cause various degrading effects on the transmitted signals including multipath and polarization fading. Depending on the frequency spectrum of the transmitted signal, the structure of the ionosphere and earth's magnetic field, the electromagnetic wave entering the ionosphere may split into ordinary (O) and extraordinary (X) modes and also travel through different paths each having its own time delay, polarization, doppler spread, attenuation, wavenumber, group delay and phase shift. Thus, when these modes from different layers and/or ground reflections are collected at the receiving antenna array, the signals may add up destructively or constructively. This situation is generally referred to as multipath fading. The O and X modes undergo Faraday rotation and due to the time variation of the electron content, the rotation angle changes with time causing polarization fading at the receiver array. For proper recovery of the transmitted signals, the modes and mutipath components need to be successfully separated at the receiver. There have been various efforts to separate the modes and overcome the degrading effects of fading. One major direction is to apply diversity techniques including angle of arrival (AOA), polarization, frequency and time diversity to cope with multipath and polarization fading. Although all of the diversity methods have certain advantages, due to time, space and frequency variant structure of the ionosphere, none of the above listed diversity techniques is a universal solution to the fading problem. One of the most commonly used adaptive receiver for the fading multipath channel of HF has been the RAKE receiver which is formed by two tapped delay lines (or matched filters) and the outputs are compared for decision making. The tap gains of the delay lines are adjusted by cross correlating the received signal by the reference signals at the receiver. Although this kind of receiver has been in use for some time, it has been demonstrated that its performance for channels with even moderate Intersymbol Interference (ISI) is unacceptable. Also, according to the data provided by ITU on the structure of the ionosphere, the time delay between two modes can be as high as 5 ms and as low as 1 ms]. Thus, in order to accommodate and separate the modes, the total length of the tapped delay line should be extremely large. This requirement increases the computational complexity and memory load and thus the system performance degrades accordingly. The ordinary (O) and extraordinary (X) modes of the electromagnetic wave in the ionosphere have orthogonal polarizations. Thus, ideally, by employing two perpendicular antennas oriented according to the earth's magnetic field components, these modes can be resolved. In the ionosphere, O and X modes travel with different wave vectors, different paths, different time delays and different frequency shifts causing the modes to suffer different amplitude, phase and polarization variations. The variation of the polarization is also known as Faraday Rotation. The Faraday Rotation is proportional to both the distance traveled and the difference in wave numbers of the ordinary and extraordinary modes. The wave number is a function of the relative dielectric constant in which electron concentration is the major parameter. In order to apply this technique successfully and separate the modes exactly at the receiver site, the polarization properties of the waves, the electron concentrations at the exit of the ionosphere, and directions of the earth's magnetic field components are need to be known at the receiver with very high accuracy. Moreover, in the techniques that separate the modes using the polarization components on the orthogonal antennas, the components separated are not necessarily the orthogonal components of the modes at the exit of the ionosphere. 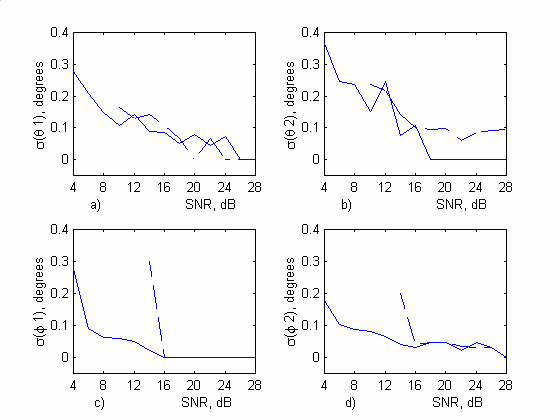 Thus, although separation of modes with this method is possible theoretically, the results are not very reliable when various multimode signals impinge on the antennas from multilayer ionosphere. The mode separation using the orthogonality of polarization method also produces erroneous results when the polarization of the modes are linear (quasi-transverse propagation) instead of being circular. We adopted the basic algebraic subspace methods for blind source estimation and developed an algorithm which can separate the multipath modes successfully and find their arrival angles with high accuracy. With typical array apertures, the resolution capability of the developed method (which will be called MS-DOA for Multipath Separation-Direction Of Arrival) can get as low as 0.2 degrees without the help of any preprocessing techniques. For homogeneous arrays, the number of antennas that are required in the array has to be one more than the number of incoming signals. The developed technique also allows the user to recover the multipath signals with very high accuracy. In MS-DOA, both the array output vector and incoming signal vector are expanded in terms of a basis vector set. A linear system of equations equation is formed using the coefficients of the basis vector for the array output vector, the incoming signal vector and the array manifold. The angles of arrival in elevation and azimuth are obtained as the maximizers of the sum of the magnitude squares of the projection of the signal coefficients on the column space of the array manifold. Once the array manifold is estimated then the incoming signals can also be determined using the basis vectors and signal coefficients. For certain array configurations, the search for maximizing angles can be eliminated by using closed form solutions of the constructed linear system. Alternative search algorithms for the maximizers of the projection sum are investigated . Genetic Search Algorithms provide promising results for forming the search space. Studies are continuing in this area for the optimization of the search routines for various ionospheric conditions, SNRs, array manifold formation and antenna choice. For the case of estimating direction of arrival of unknown deterministic wideband signals arriving from different directions to a passive array, a generalization on the EM algorithm is developed by using a tree-structured multiple level data mapping. Tree-structured EM (TSEM) is demonstrated to converge faster than conventional EM and provides considerable saving in the computational complexity. Cross-Ambiguity Function (CAF) characterized the output of a matched filter when the input signal is delayed and Doppler shifted. It is mostly used in radar, sonar and mobile communication in detection of signals with regard to the known input signal. A new array processing technique called Cross-Ambiguity Function Direction Finding (CAF-DF) is developed for the first time in literature. The CAF-DF estimates direction of arrival, time delay and Doppler shift corresponding to the impinging signals onto a sensor array in an iterative manner. Starting point of each iteration is CAF computation at the output of each sensor element. 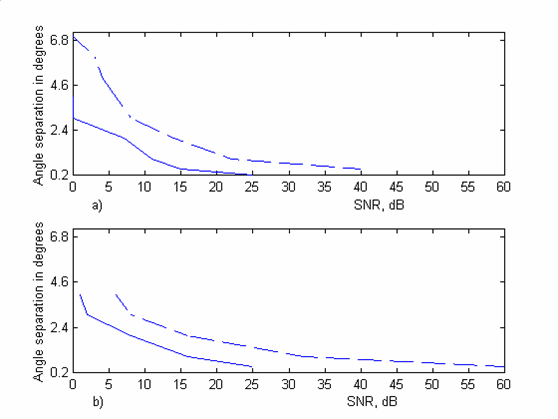 Then, using incoherent integration of the computed CAFs, the strongest signal in the delay-Doppler domain is detected. Based on the observed phases of the obtained peak across all the sensors, the DOA of the strongest signal is estimated. Having found the DOA, CAF of the coherently integrated sensor outputs is computed to find accurate delay and Doppler estimates for the strongest signal. Then, for each sensor in the array, a copy of the strongest signal that should be observed at the sensor is constructed and eliminated from the sensor output to start the next iteration. Iterations continue until there is no detectable peak on the incoherently integrated CAFs. Performance of CAF is significantly better both on simulated signals of the ionosphere and on the experimental data. Especially in difficult scenarios involving low SNR and highly correlated signals, resolution capability of the CAF-DF is very promising. N. Cadalli and O.Arikan, Wide--Band Maximum Likelihood Direction Finding and Signal Parameter Estimation by Using the Tree--Structured EM Algorithm, IEEE Trans.Signal Processing, vol. 47, 1999, pp. 201-206. F. Arikan, N. Yilmaz, O. Arikan and M.K.B.H. Miled, Mode separation and DOA estimation in HF links, Radio Science, 38(1), 7-1 -- 7-14, 2003. Nihat Yilmaz, A New Method for HF Multipath Separation and Estimation of Arrival Angles, (in Turkish) M.Sc. Thesis, Hacettepe University, 2000. M. Burak Guldogan, A Novel Array Signal Processing Technique for Multipath Channel Parameter Estimation, M.Sc. Thesis, Bilkent University, Ankara, Turkey, July 2006. B. Guldogan , O. Arikan, F. Arikan, `A New Technique for Direction-Of-Arrival Estimation for Ionospheric Multipath Channels´, Abstracts Booklet of IRI/COST 296-2007, Institute of Atmospheric Physics, Prague, Czech Republic, 10 - 14 July 2007. F. Arikan, O. Koroglu, S. Fidan, O. Arikan, B. Guldogan, N. Yilmaz, `Multipath Separation-Direction-Of-Arrival (MS-DOA) with Genetic Search Algorithm for HF Channels ´, Abstracts Booklet of IRI/COST 296-2007, Institute of Atmospheric Physics, Prague, Czech Republic, 10 - 14 July 2007.